From left: Antonia Hernández, Councilmember Gil Cedillo, Mayor Eric Garcetti and City Attorney Mike Feuer. Offering a powerful and pointed response to the anti-immigrant rhetoric espoused by the President-elect as a hallmark of his campaign, Los Angeles Mayor Eric Garcetti was joined earlier today by L.A. County Supervisor Hilda L. Solis, City Councilmember Gil Cedillo, City Attorney Mike Feuer, California Community Foundation president and CEO Antonia Hernandez, the Weingart Foundation’s Fred Ali and Robert K. Ross, M.D., president and CEO of The California Endowment. The philanthropic and elected leaders came together at a press conference to announce the creation of a $10 million fund to assist immigrants facing deportation. Amidst the fear and uncertainty that has followed the election, many hard-working, law-abiding immigrants worry that a Trump administration will make good on his threats to crackdown on undocumented residents in the U.S. Thousands of immigrants, many detained for minor infractions, are already being rushed through deportation proceedings in large groups of up to 100 at a time in courtrooms flouting due process across the country. Without adequate legal counsel, many are simply warehoused until they can be summarily tried, convicted and deported, leaving their families destitute and in limbo. Underage children born in the U.S., left suddenly on their own without one or both of their parents, are finding themselves caught up in an already overburdened network of child protective services. Often among the most vulnerable and economically marginalized populations, immigrants can rarely afford to retain licensed legal representation once immigration proceedings have been initiated. As a consequence, many fall victim to unscrupulous “notarios” who promise to intercede on their behalf and halt the proceedings for a fee, exploiting the anxiety that now plagues immigrant communities with increased intensity. 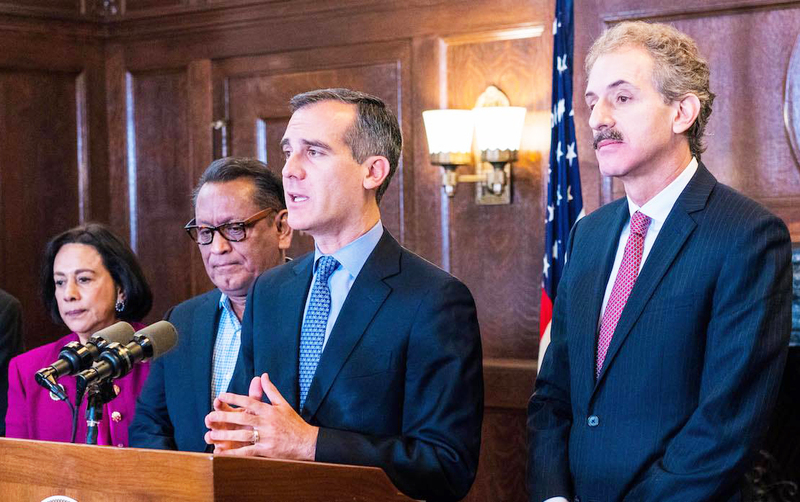 The result of a private and public partnership comprised by the City of Los Angeles, Los Angeles County, The California Endowment, the Weingart Foundation and the California Community Foundation, the L.A. Justice Fund--announced before an assembled audience of media and immigrant rights advocates--will provide access to legitimate legal representation, said Mayor Garcetti. According to him, half of the fund will come from the private foundations, and the remaining half will be allocated by the City and the County from their respective operating budgets. “We must increase our efforts to provide legal representation for immigrant residents who need a lawyer but can’t afford one,” said Supervisor Solis. “Right now, the most important step we can take is to establish this legal aid fund so that our most vulnerable communities know that we are working to keep them safe and protected.” The L.A. Justice Fund will be up and running in early 2017. Participant funding partners will reconvene in the upcoming weeks to determine the most effective method for fund allocation. “In this climate of fear, it’s crucial that immigrants turn to legitimate lawyers so they aren’t victimized by scam artists who prey on their vulnerability,” he affirmed. In the wake of November's surprise election returns, Los Angeles and its leaders have sought to position the city as a pillar of inclusion that welcomes and celebrates diversity. The Los Angeles Police Department, under a policy directive from both the Mayor and Chief Charlie Beck, will continue upholding Special Order #40, an ordinance which prohibits any police investigations conducted solely to establish a person’s immigration status. Mayor Garcetti has also convened several immigration forums across the city to hear community concerns and formulate a tangible set of responses. And he recently joined mayors, as well as other municipal leaders, from throughout the country in a high-profile call for an extension of DACA by the incoming Administration. Mayor Garcetti, the grandson of an immigrant from Mexico, has been a vocal proponent of improved city services for immigrant populations at the local level. The Mayor’s Office of Immigrant Affairs--a department charged with supporting the successful and positive integration of immigrants into the civic, social and commercial sectors of the city--had been shuttered under previous mayoral administrations. Raising concern for L.A.'s immigrant communities to an administrative priority, Garcetti re-constituted the Office of Immigrant Affairs in 2013, shortly after his election. According to estimates, there are 3,700 unrepresented immigrant detainees in the greater Los Angeles area. In addition, there are thousands of immigrants not currently detained that are or may soon be actively engaged in complex legal proceedings which are difficult to navigate even with the assistance of an attorney. “We applaud the City and County of Los Angeles in establishing the L.A. Justice Fund whose focus will be to protect our undocumented brothers and sisters who have contributed significantly to our economy and enrich California’s diversity,” said Robert K. Ross, M.D., president and CEO of The California Endowment. Dr. Ross, the executive behind a successful state-wide, multi-year “Building Healthy Communities” initiative, has long argued that health and well-being are critical quality of life indicators. California’s economy, education, human potential and more, are improved when those indicators go up anywhere, be it in a single home, throughout a neighborhood or across an entire city. “To ensure the health of our great state remains strong we need to make sure all of our residents are safe, healthy and protected,” he said, underscoring Endowment support of the pioneering L.A. Justice Fund as a partner and a funding source. Angelenos seeking to contribute to the L.A. Justice Fund can do so by visiting calfund.org/lajusticefund.